2) Unzip this package on to your computer say on desktop or on “C” or “D” drive or in my documents. Its your choice. 3) Now simply click on PramukhIME.exe and start Pramukh IME. 4) You will see small icon on right side of your desktop (notification area). 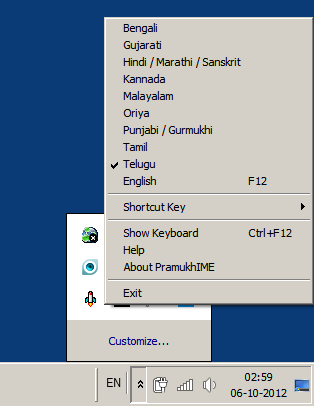 5) Now right click on that icon and select Telugu option. 6) Open your favorite word processor and start typing in Telugu. If you cant type even following all these instruction. Read “PramukhIME.chm” help file which have in detail documentation. That’s plus point of developer as he have covered help documentation too. We hope this PramukhIME will help you for your telugu typing experience. Keep this on your pendrive and start typing in telugu any where,any time. No need of installation. Leave your feedback and question and reviews about this post and software. This entry was posted on Saturday, October 6th, 2012 at 9:44 am	and is filed under Telugu Typing. You can follow any responses to this entry through the RSS 2.0 feed. You can leave a response, or trackback from your own site. కానీ వీలవటం లేదు సహాయం చెయ్యగలరు.